Self-clinching nuts, studs, and standoffs are installed into printed circuit boards (PCB) during fabrication or final assembly. These metric fasteners connect the PC board to another board, a metal chassis, or other component. These parts are made from stainless steel, carbon steel or brass and are designed to work with most hard or brittle materials or materials too thin for threading. These include epoxy or resin with paper, nylon, glass laminates, canvas, and polycarbonate or acrylic panels. The most common self-clinching fasteners used on printed circuit boards include broaching type fasteners. Because the PC board materials do not work with cold-flow processing, the fastener must grip the board to maintain resistance to the torque, weight, and pull a component projects onto the fastener. When using a self-clinching nut, stud, or standoff for a PC board, choosing the correct fastener material is important. Another important factor to consider is the size of the fastener. Miniature designed hardware take up minimum space on the PCB and once applied, they are permanent threads for the product to allow for component attachment or mounting. Using a self-clinching fastener as an attachment or mounting fixture ensures the internal circuitry is protected. No loose hardware can break off or twist resulting in hardware damage. They also promote faster assembly times, reduce the need for loose hardware, and are a cost effective way to complete your PCB assembly. 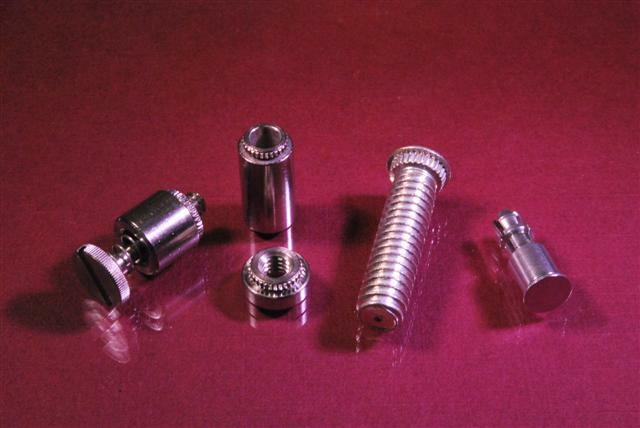 Contact JHP Fasteners, We Can Help With Your Self-Clinching Fasteners for PC Boards Needs! For more information on permanent threading through self-clinching nuts, studs, and thru-hole standoffs, contact JHP Fasteners. For printed circuit boards, we will help you choose the proper inch or metric fastener to use in your fabrication and assembly.